Wenjing Lou is the W. C. English Professor of Computer Science at Virginia Tech and a Fellow of the IEEE. She holds a Ph.D. in Electrical and Computer Engineering from the University of Florida. 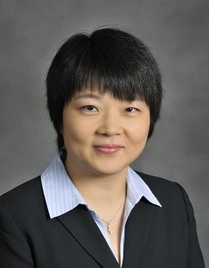 Her research interests cover many topics in the cybersecurity field, with her current research interest focusing on privacy protection techniques in networked information systems and cross-layer security enhancement in wireless networks. Prof. Lou is currently on the editorial boards of ACM/IEEE Transactions on Networking, IEEE Transactions on Mobile Computing, and Journal of Computer Security. She is the Steering Committee Chair of IEEE Conference on Communications and Network Security (IEEE CNS), which is a conference series in IEEE Communications Society (ComSoc) core conference portfolio and the only ComSoc conference focusing solely on cybersecurity. Prof. Lou served as a program director at the US National Science Foundation (NSF) from August 2014 to August 2017. At NSF, her responsibilities included the Networking Technology and Systems (NeTS) program, a core program of the Computer and Network Systems (CNS) division within the Directorate for Computer & Information Science & Engineering (CISE), and the Secure and Trustworthy Cyberspace (SaTC) program, a cross-cutting security program led by CISE/CNS. Editor, IEEE Wireless Communications Letters, Aug 2011 ~ Dec 2014. Editor, IEEE Transactions on Parallel and Distributed Systems, Jan 2012 ~ Jun 2014. Editor, Wireless Networks, Jan 2011 ~ April 2013. Editor, Computer Networks, Nov 2009 ~ Oct 2012. Editor, IEEE Transactions on Smart Grid, March 2010 ~ Feb 2012. Editor, IEEE Transactions on Wireless Communications, Jan 2007 ~ Dec 2011. Guest Editor, International Journal of Wireless Information Networks, special issue on Mobile Ad-hoc and Sensor Systems, 2006. TPC Chair, IEEE INFOCOM 2019, April 29-May 02, 2019, Paris, France. Steering Committee Chair, IEEE Conference on Communications and Network Security (IEEE CNS). Steering Committee Member, International Workshop on Security and Privacy in Cloud Computing (SPCC). TPC Vice Chair, Networking and Mobile Computing Track, International Conference on Parallel Processing (ICPP 2014), September 8-13, 2014, Minneapolis, MN, USA. TPC Chair, First IEEE Conference on Communications and Network Security (IEEE CNS), October 14-16, 2013, Washington DC, USA. TPC Symposium Chair, Communication and Information System Security Symposium, IEEE Global Telecommunications Conference (GLOBECOM 2012), December 3-7, 2012, Anaheim, CA, USA. TPC Co-Chair, International Conference on Security and Cryptography (SECRYPT 2012), July 24-27, Rome, Italy. TPC Track Chair, Security and Localization Track, 22nd Annual IEEE International symposium on Personal, Indoor and Mobile Radio Communications (PIMRC 2011), September 11-14, Toronto, Canada. Student Travel Award Chair, IEEE SECON 2011, June 27-30, 2011, Salt Lake City, Utah, USA. TPC Chair, First ICDCS Workshop on Security and Privacy in Cloud Computing (ICDCS-SPCC 2010, in conjunction with ICDCS 2010), June 25, 2010, Genoa, Italy . TPC Symposium Chair, Communication and Information System Security Symposium, IEEE International Conference on Communications (ICC 2010), May 23-27, 2010, Cape Town, South Africa. TPC Track Chair, Network Security and Privacy Track, 18th International Conference on Computer Communications and Networks (ICCCN 2009), August 2-6, 2009, San Francisco, CA. TPC Symposium Chair, General Symposium, IEEE Global Telecommunications Conference (GLOBECOM 2007), Nov 26-30, 2007, Washington DC, USA. Publicity Chair, International Conference on Broadband Communications, Networks, and Systems (BroadNets 2006), October 9-13, 2006, San Jose, CA, USA. TPC Vice Chair, International Conference on Embedded Software and Systems (ICESS-2005), December 16-18, 2005, Xi'an, P.R.China. Finance/Registration Chair, IEEE International Conference on Mobile Ad-hoc and Sensor Systems (MASS-2005), November 7-10, 2005, Washington DC, USA. Publicity Chair, International Conference on Multimedia Services Access Networks (MSAN 2005), April 18-20, 2005, Orlando, FL, USA. 8th Workshop on Secure Network Protocols (NPSec 2013), October 7-11, Gottingen, Germany. 18th European Symposium on Research in Computer Security (ESORICS 2013), September 9-13, 2013, Egham, U.K.
6th ACM Conference on Security and Privacy in Wireless and Mobile Networks (ACM WiSec 2013), April 17-19, 2013, Budapest, Hungary. 11th IEEE International Conference on Pervasive Computing and Communications (IEEE PerCom 2013), March 18-22, 2013, San Diego, USA. 7th Workshop on Secure Network Protocols (NPSec 2012), October 30, 2012, Austin, Texas. 17th European Symposium on Research in Computer Security (ESORICS 2012), September 10-12, 2012, Pisa, Italy. 8th International Conference on Security and Privacy in Communication Networks (SecureComm 2012), September 3-5, 2012, Padua, Italy. International Conference on Computer Communications and Networks (ICCCN 2012), July 30 ~ August 2, 2012, Munich, Germany. The Third International Workshop on Security and Privacy in Cloud Computing (SPCC 2012), Jun 18-21, 2012, Macau, China, in conjunction with ICDCS 2011. 5th ACM Conference on Wireless Network Security (WiSec 2012), April 16-18, 2012, Tuscon, AZ, USA. The 19th IEEE International Conference on Network Protocols (ICNP 2011), October 17-20, 2011, Vancouver, Canada. The 7th International ICST Conference on Security and Privacy in Communication Networks (SecureComm 2011), September 7-9, 2011, London, UK. The 5th International Conference on Network and System Security (NSS 2011), September 6-8, 2011, Milan, Italy. The 8th IEEE International Conference on Mobile Ad-hoc and Sensor Systems (MASS 2011), October 17-22, 2011, Valencia, Spain. International Conference on Computer Communications and Networks (ICCCN 2011), July 31 ~ August 4, 2011, Maui, Hawaii. 8th Annual IEEE Communication Society Conference on Sensor, Mesh and Ad Hoc Communications and Networks (SECON 2011), June 27 ~30, 2011, Salt Lake City, Utah, USA. The Second International Workshop on Security and Privacy in Cloud Computing (SPCC 2011), Jun 20~24, 2011, Minneapolis, Minnesota, in conjunction with ICDCS 2011. The First International Workshop on Data Center Performance (DCPerf 2011), Jun 24, 2011, Minneapolis, Minnesota, in conjunction with ICDCS 2011. The 31th International Conference on Distributed Computing Systems (ICDCS 2011), June 20~24, 2011, Minneapolis, Minnesota. Second International Workshop on Data Security and Privacy in Wireless Networks (D-SPAN), in conjunction with WoWMoM 2011, June 20, 2011, Lucca, Italy. IEEE International Conference on Communications (ICC 2011), June 5-9, 2011, Kyoto, Japan. Military Communications Conference (MILCOM 2010), October/November, 2010, San Jose, CA, USA. The 7th IEEE International Conference on Mobile Ad-hoc and Sensor Systems (MASS-2010), October/November, 2010, San Francisco, CA, USA. The 18th IEEE International Conference on Network Protocols (ICNP 2010), October 5-8, 2010, Kyoto, Japan. The 39th International Conference on Parallel Processing (ICPP 2010), September 13-16, 2010, San Diego, CA. International Conference on Security and Cryptography (SECRYPT 2010), July 26-28, 2010, Athens, Greece. 5th IEEE International Conference on Networking, Architecture, and Storage (NAS 2010), July 15-17, Macau, China. The 30th International Conference on Distributed Computing Systems (ICDCS 2010), Privacy and Security Track, Wireless and Mobile Computing Track, June 21~25, 2010, Genoa, Italy. First International Workshop on Data Security and Privacy in Wireless Networks (D-SPAN), in conjunction with WoWMoM 2010, June 14, 2010, Montreal, QC Canada. WoWMoM 2010, June 14~17, 2010, Montreal, QC Canada. 3rd ACM Conference on Wireless Network Security (WiSec 2010), March 22-24, 2010, Stevens Institute of Technology, Hoboken, NJ, USA. IEEE INFOCOM 2010, March 15-19, 2010, San Diego, CA, USA. International Conference on Distributed Computing and Networking (ICDCN 2010), January 3-6, 2010, Kolkata, India. International Conference on New Technologies, Mobility and Security (IFIP NTMS 2009), December 20-23, 2009, Cairo, Egypt. 14th European Symposium on Research in Computer Security (ESORICS 2009), September 21-25, 2009, Saint Malo, France. The 17th IEEE International Conference on Network Protocols (ICNP 2009), October 13-16, 2009, Princeton, NJ, USA. IEEE Global Telecommunications Conference (GLOBECOM 2009), Wireless Networking Symposium, Nov 30-December 4, 2009, Honolulu, Hawaii, USA. International Conference on Wireless Algorithms, Systems and Applications (WASA 2009), August 16-18, 2009, Boston, MA, USA. The 17th International Workshop on Quality of Service (IWQoS 2009), July 13-15, 2009, Charleston, South Carolina. IEEE International Conference on Networking, Architecture, and Storage (NAS 2009), July 9-11, Zhang Jia Jie, Hunan, China. The 29th International Conference on Distributed Computing Systems (ICDCS 2009), June 22-26, 2009, Montreal, Quebec, Canada. The 10th ACM International Symposium on Mobile Ad Hoc Networking and Computing (MobiHoc 2009), May18-21, New Orleans, Louisana. IEEE INFOCOM 2009, April 19-25, 2009, Rio de Janeiro, Brazil. IEEE International Conference on Communications (ICC 2009), Wireless Networking Symposium, and Ad Hoc and Sensor Networking Symposium. The 28th International Conference on Distributed Computing Systems (ICDCS 2008), June 17-20, 2008, Beijing, China. The 9th ACM International Symposium on Mobile Ad Hoc Networking and Computing (MobiHoc 2008), May 26-30, Hong Kong, China. IEEE International Conference on Communications (ICC 2008), May 19-23, Beijing, China. IEEE INFOCOM 2008, April 13-19, 2008, Phoenix, Arizona, USA. IEEE Wireless Communications and Networking Conference (WCNC 2008), March 31 - April 3, Las Vegas, Nevada, USA. IEEE Global Telecommunications Conference (GLOBECOM 2007), General Symposium and Ad Hoc and Sensor Networking Symposium, Nov 26-30, 2007, Washington DC, USA. First International Symposium on Data, Privacy, and E-Commerce (ISDPE 2007), November 1-3, 2007, ChengDu, China. IEEE 66th Vehicular Technology Conference (VTC2007-Fall), Mobile Networks Track, September 30-October 3, 2006, Baltimore, MD, USA. International Conference on Communications and Networking in China (CHINACOM 2007), August 22-24, 2007, Shanghai, China. First Workshop on the Security and Privacy of Emerging Ubiquitous Communication Systems, August 6-10, 2007, Philadelphia, Pennsylvania, USA. International Conference on Wireless Algorithms, Systems, and Applications (WASA 2007), August 1-3, 2007, Chicago, IL,USA. IEEE International Conference on Communications (ICC 2007), Symposium on Wireless Ad Hoc and Sensor Networks, June 24-28, 2007, Glasgow, Scotland, UK. IEEE INFOCOM 2007, May 6-12, 2007, Anchorage, Alaska, USA. IEEE Global Telecommunications Conference (GLOBECOM 2006), Symposium on Wireless Ad Hoc and Sensor Networks, November 27-December 1, 2006, San Francisco, CA, USA. International Conference on Communications and Networking in China (CHINACOM 2006), October 16-19, 2006, Beijing, China. International Conference on Computer Communications and Networks (ICCCN 2006), October 9-11, Arlington, VA, USA. International Conference on Broadband Communications, Networks, and Systems (BroadNets 2006), Wireless Communications, Networks, and Systems Symposium , October 9-13, 2006, San Jose, CA, USA. International Conference on Wireless Algorithms, Systems, and Applications (WASA 2006), August 15-18, 2006, Xi'an, China. The 4th ACS/IEEE International Conference on Computer Systems and Applications (AICCSA 2006), March 8-11, 2006, Dubai/Sharjah, UAE. International Conference on Broadband Networks (BroadNets 2005), Broadband Wireless Networking Symposium , October 3-7, 2005, Boston, MA, USA. IEEE Global Telecommunications Conference (GLOBECOM 2005), Wireless Communications Symposium, November 28-December 2, 2005, St. Louis, MO, USA. IEEE Wireless Communications and Networking Conference (WCNC 2005), March 13-17, 2005, New Orleans, LA, USA. IEEE INFOCOM 2005, March 13-17, 2005, Miami, FL, USA. International Conference on Broadband Networks (BroadNets 2004), Broadband Wireless Networking Symposium , October 25-29, 2004, San Jose, CA, USA. IEEE Wireless Communications and Networking Conference (WCNC 2004), March 21-25, 2004, Atlanta, GA, USA.